Power Source Electrics (PSE) is a Sydney based and Shoalhaven based business servicing the residential area, high end builders, business owners and strata managers; covering all aspects of electrical works in the Western Sydney, South Western Sydney and Shoalhaven areas from minor electrical installations, repairs and maintenance to larger and more complex works. We strive to be the preferred local Electricians in these areas. Power Source Electrics is dedicated to providing the highest quality solutions to its commercial and residential customers, with a focus on quality workmanship, using only premium brands and offering warranties on all our installations. Why are we different from every other ordinary electrician? We care about quality, best value for money, as well as reliability & attention to detail. We are fully licenced & insured, honest & trustworthy which gives our customers a piece of mind. We tick all the boxes when it comes to energy saving, electrical safety, which is paramount to us, being environmentally friendly, offer expert advice and leave your place tidy with no mess. Power Source Electrics is the current preferred electrician contractor for "Better Homes and Gardens". Other major clients include Matt Blatt, Hunter Pacific, Stephen Lowy, Mark Bouris and Anthony Mundine. Call us and speak to: Michael on 0433 363 675. "Every project we complete is of the highest quality in both workmanship and the products we use"
PSE is a family owned business and has been operating in the elecrical industry since 2002, providing all aspeacts of electrical services throughout Western Sydney, the Hills District, South Western Sydney suburbs and the Shoalhaven area. With more than a decade of providing electrical solutions for our customers, we are experienced electrical contractors and manage a team to ensure we deliver exactly what the customer requests. Every project we complete is of the highest quality in both workmanship and the products we use. Another important factor is our reliability. We do what we say and once the project is completed it will leave you happily satisfied. We are conscious not to overrun the customer's budget, and we take careful consideration to ensure that we offer reasonable prices without compromising our quality. We give you a fixed price for each of the options you require and a time frame when the project will start and when it will finish. Our aim is to ensure that we deliver the best overall value for money on every project we undertake. We are also conscious of all the safety requirements and we ensure that all persons and property affected by our activities are protected at all times. We strive to be the preferred Western Sydney, South Western Sydney and Shoalhaven Electricians. Please feel free to Contact us or Request a Quote or simply call us and speak to: Michael on 0433 363 675. 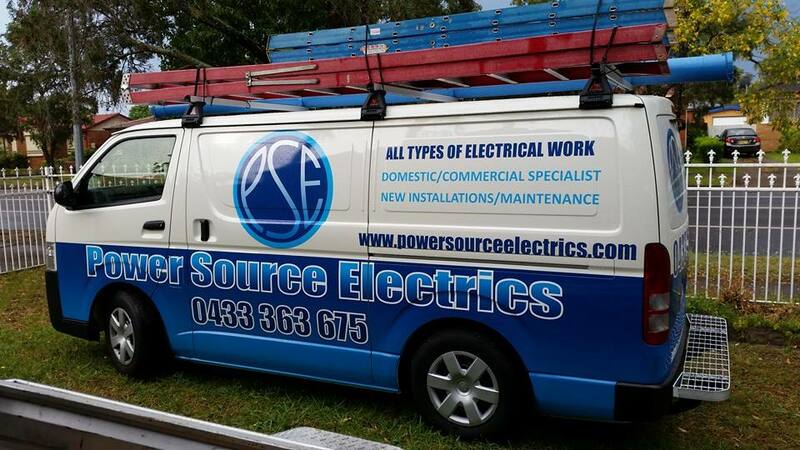 We are your local electricians in Sydney and the Shoalhaven area. We are electrician specialists in all domestic and commercial applications. PSE is the current preferred electrician contractor for "Better Homes and Gardens". Other major clients include Matt Blatt, Hunter Pacific, Stephen Lowy, Mark Bouris and Anthony Mundine. "I first engaged Power Source Electrics some 4 years ago as it was recommended to me by a friend. At the time I was renovating our house and was having the normal issues with tradesman and the builder. I called Michael to quote and give us a fixed price on our electrical works which involved lighting (internal & external), installation of garden lights on transformers, wall lights around the pool, bollard lights at front gates, decorative lights in and around the house, spotlights, smoke detector, wall lights, safety switches, power points, and more. "Michael is extremely honest and reliable and I highly recommend Power Source Electrics whether it's a small job or a large job. Power Source Electrics have done a few little jobs for us as well as undertaken some major work during our renovations and they take pride in all the work they do.